Life may finally change, in the near future, for those who lost their homes in the devastating Masca fire, almost a year ago. The whole area is protected, which means that to rebuild they have to conform to strict regulations to ensure the new buildings integrate into their surroundings. Therefore residents have another level of bureaucracy to deal with on top of the normal rubber stamping. Architects and draftsmen have at last finalised their plans, agreed with owners, and all permissions have been issued. It is still to be decided who will be given the contract to rebuild. Some improvements have been granted within the plans. Colin and Susana will have a water tank of their own, as well as a large tank for the whole village to prevent any further problems, as this is the second time the village has been damaged by forest fires. Sadly, many hundreds of beehives, which were scattered over the areas, were burn out during the fires. 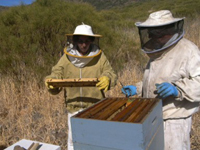 Apiarists have received some help from the central and regional governments, councils and their insurance companies, but so far the Cabildo has failed to respond to their plea. The problem not just acquiring more hives and bees but the bees’ natural habitat has been destroyed. There is no pollen, therefore no food for them, and a problem has arisen by homeless bees swarming and trying to nest in local homes.